iShares NASDAQ Biotechnology ETF (IBB) printed a fresh 52-week high Thursday, up 1.03 percent to 322.92. Now the question is whether the rally has some legs? According to our “U.S. Market Trading Map”, there could be more gains ahead for the ETF. Below is an update look at a trade in IBB. The graphic below is from our “U.S. Market Trading Map”, show the near-term technical bias and trading ranges. As shown, the underlying is in a short-term bullish trend when the price bars are painted in green. The underlying is in a short-term bearish trend when the price bars are painted in red. 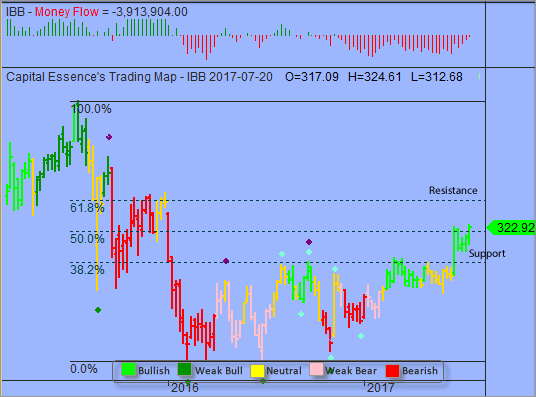 The yellow bars identify period of neutral or sideways trading pattern. Additionally, the light-blue shading represents the short-term trading range. A move above or below that range is considered overbought (as represents by the red shading) or oversold (as represents by the dark-green shading). Readings above or below the red and green shaded areas are considered extremely overbought or extremely oversold. Our “U.S. Market Trading Map” painted IBB bars in bright green (strong buy). The late June breakout pushed the ETF above the 38.2% Fibonacci retracement of the 2015 downswing, clearing an important hurdle based on Fibonacci levels. Over the past few weeks, IBB has been basing sideways after the late June rally found resistance at the 50% Fibonacci retracement, just above 320. Thursday’s rally pushed IBB above 320, signify…Click here to read more.